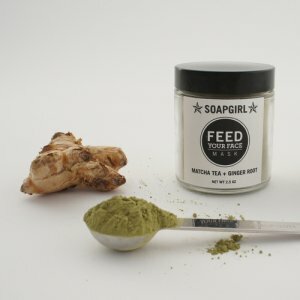 Soapgirl masks are a combination of skin-loving clays paired with organic botanicals. Mineral clays are known to tighten skin and draw out toxins. That rosy blush you see after using a clay mask indicates increased circulation - think of it as cleaning your skin from the inside. The botanicals have been specifically sourced for their individual benefits. When combined with complementary ingredients, each mask becomes a sensory experience that's also good for your skin. Feed your face! Each jar contains about 25 masks. which means that each application costs less than $.75, far less than prepared masks. You pay a lot for the convenience of those added liquid ingredients! DIRECTIONS: Simply mix into a paste using approximately 1 teaspoon mask with equal amount water or an activator of your choice, listed below. Apply evenly avoiding eye area. Rinse thoroughly with warm water. Packaged in a sturdy glass jar to encourage reuse. Perfect for spare change, stray buttons, paper clips... we’re confident you'll find a use for it!